I think banners in general are over used, generally not too well-designed, not particularly durable, too high up for people to use them for wayfinding anyhow, and that we should spend that money sprucing up the 19th and Franklin PARKING GARAGE. Those banners are definitely used a lot. I’ve seen them in Old Oakland, Rockridge, Montclair, the Dimond, Glenview, Piedmont Ave., and Temescal. A while back I started a map of place name signs in Oakland. Some are businesses (e.g., the Uptown Club) and some are wooden signs, but there’s a lot of those banners. Flawed as they are, I’d rather have the banners to help give an identity to an area than nothing at all. The metal signs from the city (e.g., San Antonio district) are boring, as are most of the wooden ones (e.g., Allendale Park). My favorites are the Oakmore Highlands sign and the new Oaksterdam mural. But there’s no excuse for the Lake Merritt banner @ Broadway and 19th. Apparently Lake Merritt gets around. 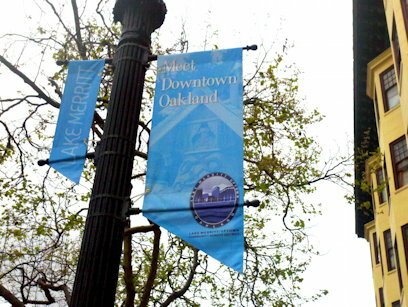 I spotted this banner on the San Pablo side of Uptown. and the photo in the banner shows the Cleveland Heights side of lake. At least Uptown is adjacent to Lake Merritt, but odd placement of the banner on the far side of Uptown.